The Waterman League has announced the final schedule for its bold new APP World Tour, the rebranded version of the old Stand Up World Series that comes with a lot of new hype alongside a major new investment round that may finally see the League fulfill the ambitious vision it’s been working towards for more than half a decade. After a determined but under-funded five years that saw the World Series run on a shoe-string and often encounter financial difficulties, the Waterman League has landed a multi-million dollar investment from a Hong Kong-based private equity firm that will give them a fresh new start and secure the elite circuit for at least the next few years. After paying off all outstanding debts late last year, including the prize money owed to athletes, the new investment is being used to try and build a strong future for the Waterman League and its pro tour, with half a dozen racing events and a whole new format scheduled for season 2017. Unlike the open entry events of the past, the top 24 men and top 12 women will be invited to compete in each exclusive race, while there will be up to 8 wildcard spots (4 for women) at each event. ‘APP’ stands for Association of Paddlesurf Professionals. After running the ‘Stand Up World Series’ (racing) and ‘Stand Up World Tour’ (surfing) in parallel, the Waterman League has now bundled both circuits together under the APP World Tour umbrella, with separate world champions to be announced for each discipline. There will be three surf contests alongside the six racing stops, with a combined week in New York making for eight separate APP events around the world this year. New York, Tokyo and Hainan (China) are the new additions to this year’s schedule. The League and its never-say-die founder Tristan Boxford have always had grand plans for turning SUP racing into something of a World Surf League-style pro tour that features the best paddlers, and now that there’s some serious cash involved they actually have a genuine shot. While not all of the world’s best have signed on for the APP World Tour (most athletes literally had to sign contracts in order to compete), it will feature most of the elite young guns along with a few famous faces that never competed on the Stand Up World Series. While the “world tour” will still lack the major standalone events such as Carolina, the Gorge, Molokai, the Pacific Paddle Games and the EuroTour, I’m certain it will be far more successful than the fledgling Stand Up World Series, which always tried hard but struggled to reach the heights it promised. The Waterman League has told athletes each event will have a $30k prize purse for the men alone (with an additional $15k for women), along with an end-of-season cash bonus for the top finishers (though I haven’t seen any official $$ total published in the press release or on the official APP site, so that amount may be subject to change). There will also be a significant investment in the media side of things, with professional live webcasts promised at each stop alongside TV distribution deals. The firm behind the cashed-up and rebranded APP World Tour, AID Partners, has strong ties to Hollywood, so we can expect they’ll use their connections to boost the profile of the tour and hopefully the sport along with it. The new-look Waterman League was privately announced to athletes as far back as September, however it was only officially unveiled to the public earlier this month. Reaction from the athletes has been mostly positive. Some are ecstatic the tour is finally properly funded, while others are cautiously waiting and seeing if the APP can avoid the same mistakes of the old World Series. There was also some initial concern over certain stipulations in the athlete contracts, however those were revised following consultation between the paddlers and APP organisers. After a rollercoaster few years, it will certainly be interesting to see what new heights the Waterman League and its APP World Tour can reach and what impact it will have on the wider sport. And we won’t have to wait very long to find out: The first stop is on Maui in just six weeks’ time. 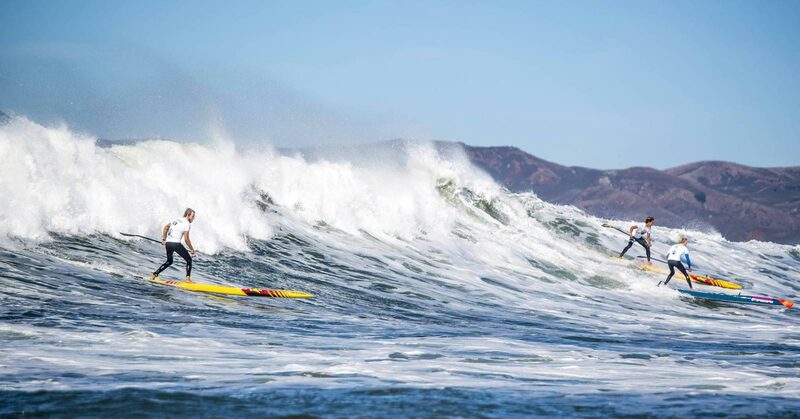 The New York event will also include a SUP surf contest, while there will be standalone surf contests on Oahu in February and the Canary Islands in December. Visit the official APP site and Facebook for more details.